These LARP arrows are safe and made of shock-absorbant and tear-resistant polyeruthane foam. They can reach up to 50 metres. 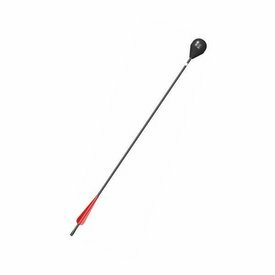 The arrows have a glass fibre shaft, which makes them strong and flexible. The length including the head is approx. 76 cm, they weigh approx. 65 grams. The arrows are suitable for bows with a draw weight of 25 lbs. Delivered in sets of 10.